Is it possible to measure the normal force at the contact patch of a tire? While there’s currently no direct method to do this, with a little creativity, it is possible to obtain an estimate of this value. 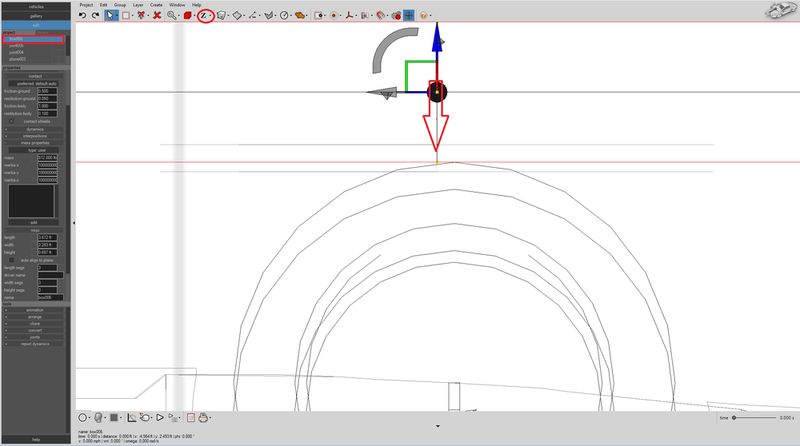 After disabling the "auto–align to plane" option, we set the roll angle to 180° and then elevate the vehicle so that it starts above the x-y plane. Now we need to anchor our vehicle down in this position so it doesn’t move as we do our measurement. Create a plane object underneath our vehicle. Set the plane to a terrain object using Create > Physics > Make Unyielding / Terrain From Selection. 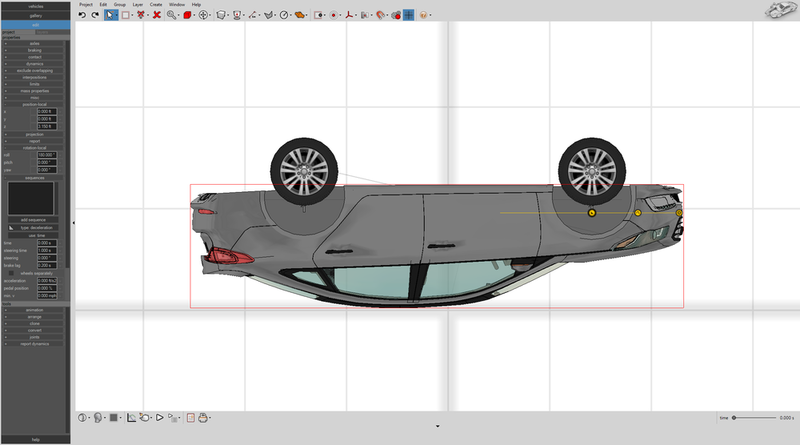 Use spherical joints to connect the front and rear of the vehicle to the plane. While monitoring the time-pitch graph, enable “fix orientation” and increase the spring stiffness and damping coefficients, as well as the spring and damping values from the joint menu. Ensure there is a negligible amount of pitch developing versus time. Next, create a box object not much larger than the tire you want to probe. Convert the box into a rigid body object. In its “contact” menu, enable “contact wheels”. In its “misc” menu, disable “auto align to plane”. As an initial guess, set the box’s weight to the total vehicle weight divided by number of wheels. In this case, we use 812 lbs (1/4 x 3249.6 lbs). Under “mass properties” set the type to “user” and set the box’s inertia-x, -y- and -z values to 1e8 to prevent any rotational effects (this effectively treats the box as a point-mass object that will only move along the z-axis direction when it interacts with the tire). In this example we'll be testing the driver side rear tire. From the vehicle's "axles" menu, we'll first select "axle 2" and change "limits-lower left" to 0, which will force the passenger side rear tire to its equivalent position when on a flat terrain with respect to the vehicle frame of reference. Next, in side orthographic view (in contours preview mode), we’ll move the box downward until we see the passenger side and driver side rear tires are aligned at time=0. Input a deceleration sequence entry for the vehicle, setting it to 100% braking with 0 seconds of lag. This will prevent the tires from rotating. With both tires aligned at their normal equilibrium positions, we’ll know if the box has the correct equivalent normal force if it doesn’t move when the simulation starts. Adjust the weight of the box up or down as needed until you see that it no longer moves. The weight of the box will then be equal to the normal force for the vehicle at this tire’s contact patch. In this example, we obtained 633.426 lbs. For this vehicle (weight = 3249.6 lbs), its 61/39 front to rear weight distribution implies we should expect the normal force at the rear contact patch to be about 3249.6 lbs x 39% / 2 = 633.7 lbs. This is in excellent agreement with our measurement using the box. Note, as you make adjustments to the block’s weight, the tire will move up or down, allowing you to probe the suspension force versus suspension spring compression. Using Excel, you can make a log of the tire final z position versus block weight. Taking the difference between the opposite tire reference z position and the test tire’s final z position will give you the spring compression away from static equilibrium. Making a graph of this value versus box weight is essentially telling you the suspension spring’s force versus compression. Fitting the slope of this graph will give you the suspension spring constant. Tags: normal force, measuring normal force, measuring suspension force, spring constant, suspension force versus deflection.